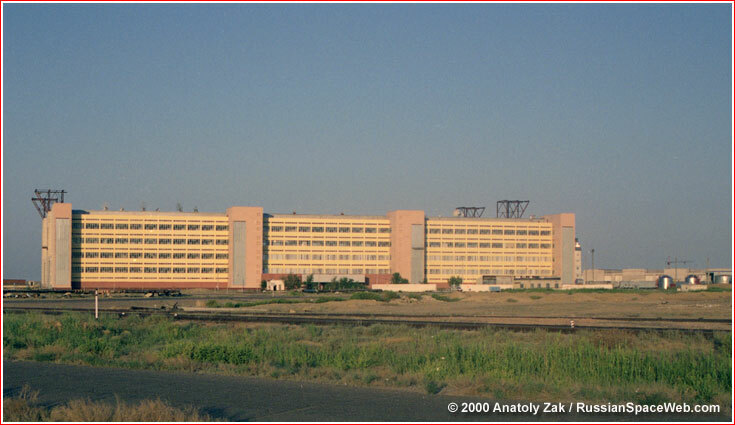 Above: Spacecraft processing building 92A-50 is one of the newest facilities in Baikonur. A huge storage site for Proton rockets can be seen on the background on the right. Before its arrival to the launch pad, the Proton rocket is assembled and tested in horizontal position at a dedicated facility located at Site 92. Building No. 92-1 is around 120 meters long and 50 meters wide. Segments of the rocket arrive into the building by rail from the Khrunichev production plant in Moscow. Up to four launchers can be processed in the building simultaneously. A pair of extensions to the building were built to handle pyrotechnic devices and various support systems. The main processing hall for Proton was designed to have one work place for the assembly of the rocket and another for integrated tests of a fully assembled vehicle. A special revolver-like device was developed for the assembly of the Proton's first stage with its central core and six strap-on tanks. Proton's unmanned passengers such as satellites or space station modules collectively known by Russian abbreviation KGCh, which stands for (Space Head Section), loaded with propellant first and packed under their fairings. Most unmanned satellites are also attached to an upper (fourth) stage, such as Block-D or Briz-M. In the next step, they are delivered to Building No. 92-1 by rail for integration and testing with the first three stages of the rocket. This is the last step in Proton integration, after which the entire stack is loaded by cranes on the flat rail transporter for its rollout to the launch pad. Yet, another facility for a storage of as many as 20 Proton rockets was built at Site 92, however, apparently it was never used to full capacity, as the Soviet space program declined at the end of the 1980s. A four-section building No. 75 A/B/V/G could house 16 fully assembled rockets and Facility No. 75Kh could hold four rockets and a pair of spacecraft. The facility also included buildings 92-75KhA and 92-75KhG. 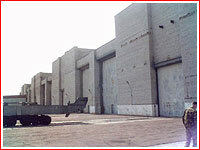 From 1998 and until December 1999, Group 9 existed to maintain all three buildings and their equipment, however later it was merged with Group 8 personnel. The overall testing as well as fueling and the pneumatic pressurization of the spacecraft can be conducted at dedicated work places inside the building. Also, the satellites can be integrated with their upper stages and covered with their payload fairings. By 2011, the facility 92A-50 was refurbished enabling parallel processing of two satellites. A large storage facility No. 75 for as many as 16 Proton rockets in Baikonur.